- In the version 1.015, the original 14x7 inventory is back. The reason for this change is that the custom 18x8 inventory which was used in the Version 1.01 occasionnaly prevented some players to access it (loading bug). 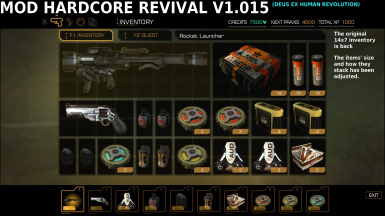 Putting the old inventory back fixed the problem. To compensate this change, some items now take a little less inventory space and most items can stack a little more. -The text prompts now match the new way of doing the takedowns (It wasn't the case in the V1.01). - Some descriptions in english and french have been changed . The mod functions with ALL languages BUT only the english texts and the french texts have been changed (As I don't speak the others languages). That said, in this version 1.015, I have included the following language files : FFFFFD64 (German), FFFFFD68 (Italian), FFFFFD70 (Spanish), FFFFFDE0 (Polish) and FFFFFF60 (Russian) to the mod. This way, people who play with the mod in theses languages can change the texts (descriptions, ect...) if they want. All they need to do is to use an hexadecimal editor to open the bin file in theses and edit the texts. - Mission 1 : At Sarif Headquarters, The player has now less time to wander around before departing in helicopter for the Sarif Manufacturing Plant. If he plans to save the hostages, that is ... In this case, he will have to make choices (Argue with Prichard ? Wander around a little ? Talk to the receptionist ? ect...). 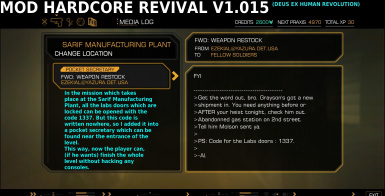 - Mission 2 : At the Sarif Manufacturing Plant, the code 1337 which unlocks all the assembly lab doors has now been included in the pocket secretary found near the start of the level (the one mentionning the black market merchant Grayson). So now, it's possible to for a player who play normally to finish the level without hacking any consols or computers at all. - Mission 2 : The hacking minigame in the hostages' rooms at the Sarif Manufacturing Plant (the one which can stop the bomb's timer) is now a little more difficult to solve as one of the node is now level 2 and the timing if the player is detected is now way shorter. 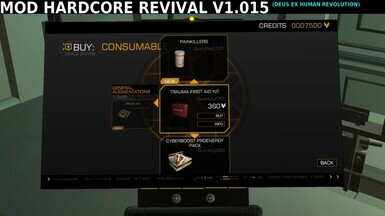 Also, the hacking mini-game of this particular console now contains a datastore with 100 additional XP points inside. 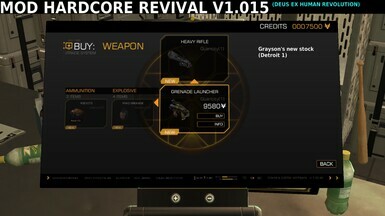 - They now sells NEW objects, including rare weapons (NB : Rare weapons are available in Detroit 1 only : If the player leaves the city for Hengsha, Grayson and Seurat won't sell them anymore when the player comes back to Detroit (but they will sell their ammunitions in small quantities). 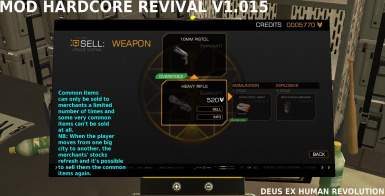 So, Grayson sells the Grenade launcher and Seurat sells the Laser rifle and the plasma rifle (In the game, a message found in Seurat's appartment indicates that he received a very special shipment but he had a very conventional stock, now it's fixed : He really received a special shipment: 2 very rare weapons). 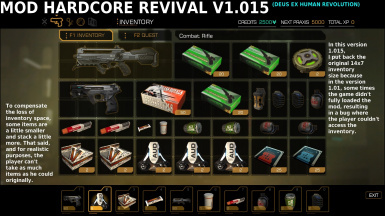 - It's not possible anymore to sell 10mm pistols, machine pistol, revolvers and shotguns to merchants, unless they have been customized with their special upgrades. 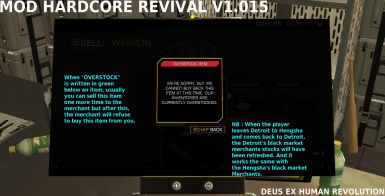 - Also, some items can be sold to merchands a limited number of time before their stock become full (but when the player leaves Detroit and Henghsa and come back later, it is reinitialized so he can sell theses items again. 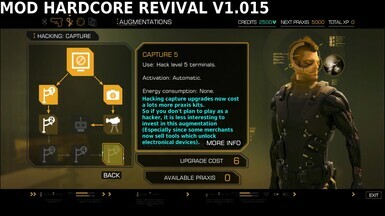 - The praxis kits needed to enable/upgrade the augmentations have been changed. 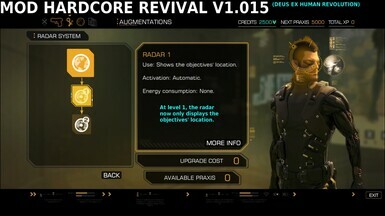 - A base level, the radar only displays the map and the objective's location. To make the radar displays characters on the radar, it needs to be upgraded to level 2. - Jensen can stay invisible for a shorter time if the invisibility augmentation is upgraded at max level (Because it made the game really too easy for player who would use the combo stun gun + invisibility). - The Armor augmentation now makes Jensen a little bit more resistant than before (Not too much, thought as he is still far from being invincible but players who prefer to fight rather than sneak will notice the difference). 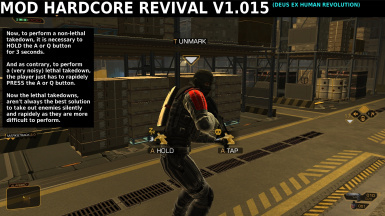 - Jensen can now sprint up to 15 seconds if he upgrades the rebreather augmentation at level 2. - Jensen starts the game with 1 energy cell (instead of 2) and this energy cells doesn't recharge automatically : To enable the energy recharge, the energy augmentation must be upgraded). 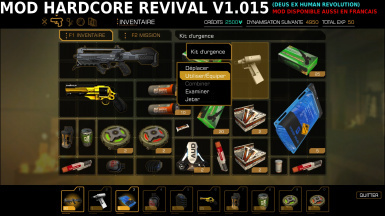 - The inventory size has been changed : It is bigger if it is upgraded at maximum level. 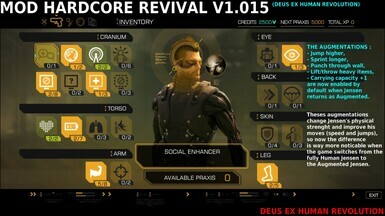 - The augmentations "Jump higher", "Sprint faster", "lift/throw heavy objects" and "punch through walls" are now enabled by default, so playing augmented Jensen really feels different compared to the Jensen who is played in the game's prologue). - The space taken by the items in the inventory has been modded : The space they take in the inventory is proportionate to their size outside of the inventory. 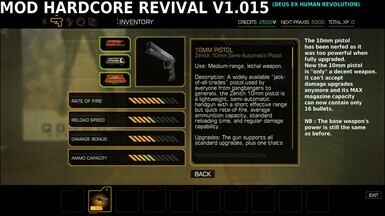 - The items' price have also been changed ( The goal is here is to prevent the player to becomes too rich too rapidely). 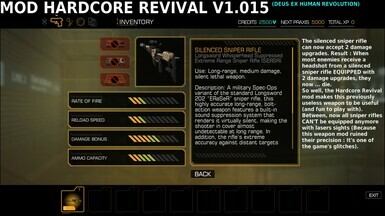 - The weapons' power have also been changed (for example, the 10mm pistol has been nerfed as he was too powerful and the silenced sniper rifle has been made more powerful). - The sniper rifles can't equip a laser sight anymore (Because equipping sniper rifles with scope ruin them as they would then become totally imprecise : It's one of the game's glitches). 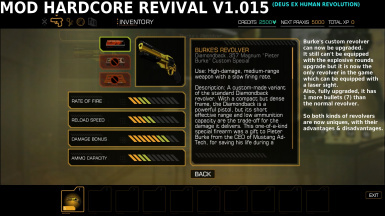 - The revolver can't equip a laser sight anymore (Only the customized Burke's revolver has one but this special revolver can't equip the special revolver upgrade). - Some quests items are now playable items (and can even be sold by the merchants). - In the quest "Back in the Saddle", the player has now only a few minutes to meet Sarif at the helipad, otherwise the hostages at the Sarif Manufacturing plant will die. 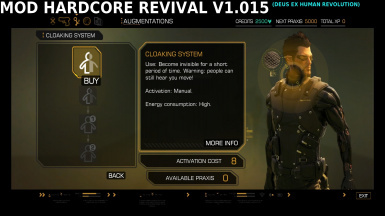 - In the quest "Cloak & Daggers", if Jensen decides to let O'Malley go, he will get 10,000 credits (instead of 3,000) which corresponds to the price of 2 praxis kits. - In the mission where the player needs to find Van Bruggen's whereabouts, if he decides to sneak and hear Tong's discussion with Nahari Khan, rather than to persuade Tong to get a rendez-vous in his office, now he will get around the same amount of XP. 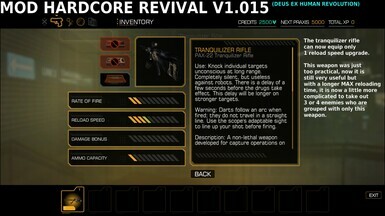 - To perform a (very noisy) lethal takedown, just press A or Q rapidely. - To perform a (very silent) non-lethal takedown, keep pressed A or Q for 3 or 4 seconds and then release the button. Now, it's more difficult to use the non-lethal takedowns, especially if the player is surprised by an enemy. And if he decides to perform a lethal takedown instead, then if there are others enemies nearby, they will most likely be alerted as the lethal takedowns do a lots of noise. 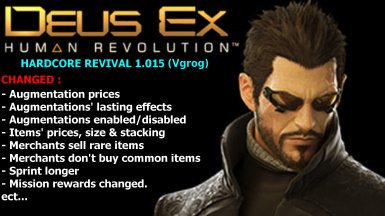 Put the file DFEngine.dll and the folder "mods" into the main folder where you installed Deus Ex Human Revolution. Also, just in case, make a backup of your original DFEngine.dll before replacing it with the one contained in the mod (this way, if there is a problem, you won't have to re-install the whole game just because of a small file). NB : Playing with this mod and an old savegame could make the game crash so it is better to start a new game. for my mod so I could share it with others players easily and without them having to do anything, excepted put the modded archive and the DFEngine.dll into the game's folder. 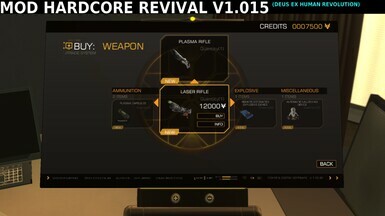 So big thanks to the creator of the Gibbed tools for Deus Ex Human Revolution and to the creator of the custom DFEngine.dll.